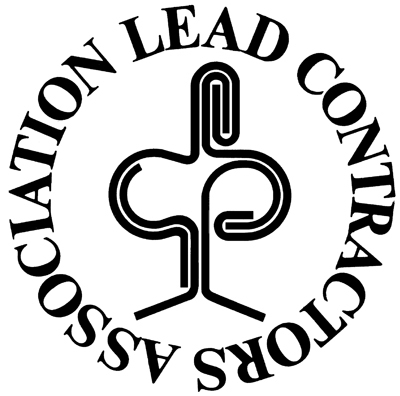 The trade body that represents the leadworking industry – and guarantees quality in that industry – is the Lead Contractors’ Association (LCA). The LCA was formed in 1984 to promote quality standards in leadwork and now comprises over 70 specialist contractors committed, supported by 15 associate members who supply materials and ancillary services. Members comprise every business model, from sole traders and partnerships to established corporate bodies. Whether they employ their own workforce or engage teams of subcontractors, members are required to take full responsibility for the purchase and application of the lead sheet under their control. Members work to an approved Code of Practice (BS 6915) and recommendations set by the Lead Sheet Association. Those standards are guaranteed by an annual vetting programme that includes compulsory on-site inspection of workmanship and design. The result is a grading system of the standard of workmanship, published annually in the Directory of Specialist Leadwork Contractors and on this website. Anyone failing to meet the standards set is required to withdraw from membership. What really sets LCA members apart is the 25-year guarantee that they offer to clients. Covering installations of £2,500 or more, the scheme was established in 1999 – the first in the construction industry to offer such peace of mind. 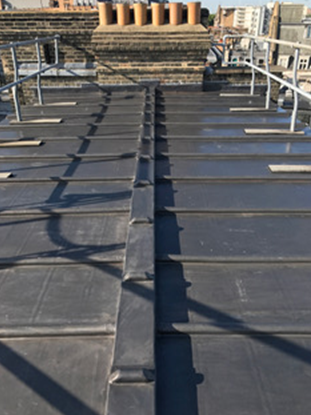 Under the scheme, after they have completed of two years of LCA membership, a member is required to offer a 25-year guarantee of workmanship and material for leadwork projects over a value of £2,500. Every project registered is vetted on completion on site by an experienced member of the LCA council: they check the installer’s leadwork as well as the design and the materials. Relevant documents, including a technical inspection report, are then filed with the LCA secretariat. If a problem occurs within the guarantee period, the LCA will contact the original installer to return to site to investigate. If the original installer is no longer trading, no longer a member of the LCA or otherwise unable – or just unwilling – to return to site, another LCA member is instructed to investigate. If the problem is confirmed as being covered by the Guarantee Scheme, remedial works are carried out without further expense to the client. All the costs are covered by a separate trust fund, which was set up and is funded collectively by LCA members and ring-fenced from other day-to-day LCA activities. The Trust Fund is insurance backed and underwritten through Lloyds of London to provide cover of up to £250,000. Moreover, the scheme is supported by all the major lead sheet manufacturers, providing an effective warranty for both labour and materials. That is why the Lead Contractors’ Association 25-Year Guarantee Scheme is a guarantee that means what it says: 25 years peace of mind for the client – guaranteed! You can find a selection of members near you in the online directory here. 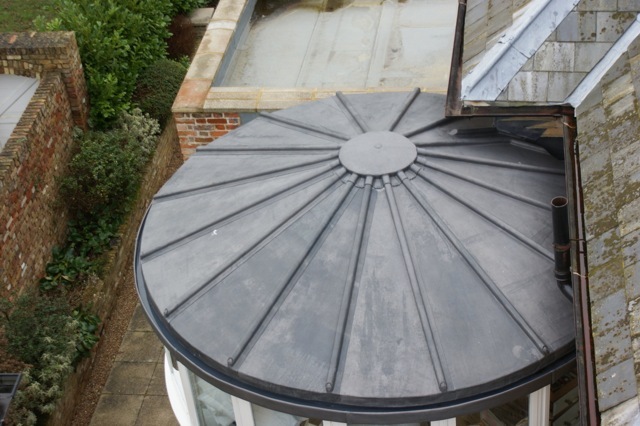 These examples of fine leadwork from Oxfordshire based LCA member Bicester Roofing are of work carried out for the National Trust on their beautiful Upton House in Banbury. 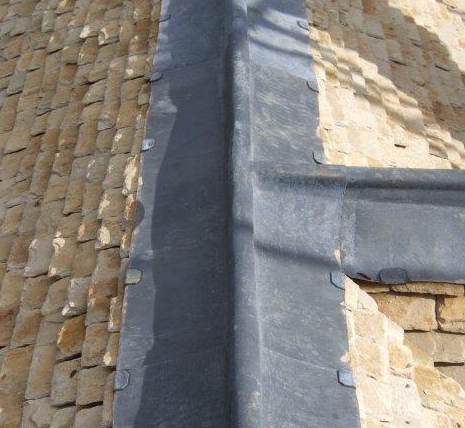 The company has a wide knowledge and expertise in lead roofing as a result of working on many Grade Listed and historic buildings. 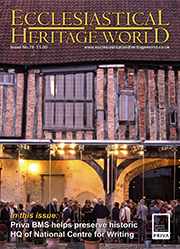 As well as Arundel Castle recent projects have included Southampton Civic Centre. The LCA has held awards for best work from its members for the last 21 years. The Murdoch Sponsors Award was added some ten years ago for the smaller installations that used less than five tonnes of lead sheet, but which could be equally as demanding of the leadworker’s skills as the larger, more eye-catching projects. Situated behind large houses in a built up area of the city, the Mews House was originally used as stables with living areas above. Along these narrow streets are some of the most spacious, luxurious houses you could find. BS Leadworks carried out a total re-roof including box gutters, dormers, flat roof, pitched roof and flashings. Unlike when the house was originally built, they had a duty to vent the roof allowing it to breathe. 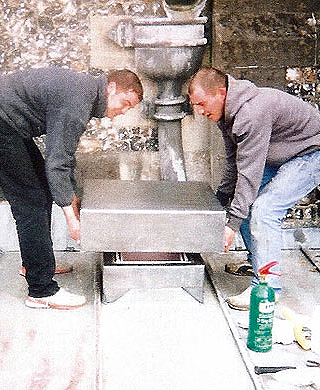 The rear box gutter was designed by the architect to fall into sump outlets and down through internal rainwater pipes. 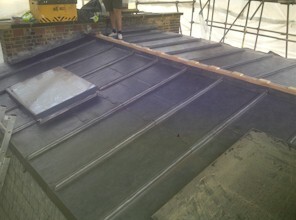 LCA members BS Leadworks fitted Code 8 lead, laid on underlay - this was ideal because it meant they did not have to step the box gutter and it could be laid in two runs due to the size allowance for Code 8. The dormer cheeks were clad in Code 5 and the roof was completed using Code 6 in a four bay formation. 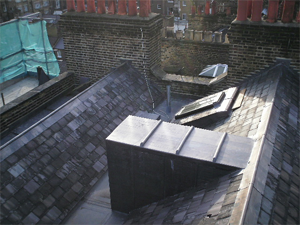 This extra roll in the dormer would slow the water down as it falls off the flat roof at the top of the dormers. 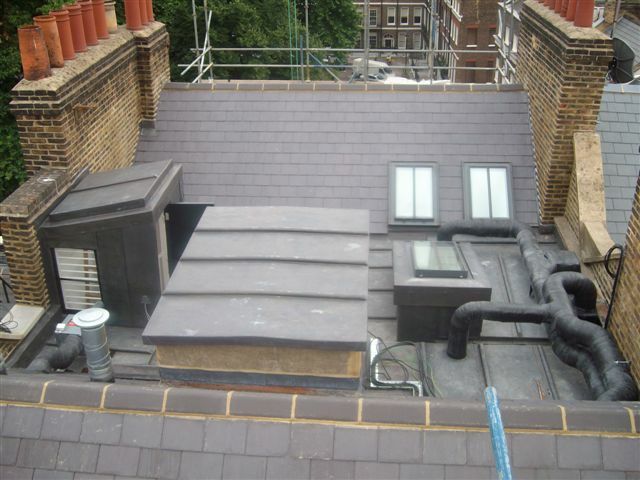 The top flat roof is vented at the front of the roof and returned out through a vented ridge detail. The rear pitched area is vented in the same way. Wood rolls were used for the joining method and Code 6 lead was laid on underlay fixed with copper nails. On the ridge details they had to allow for a ventilation gap which was built by carpenters with stainless steel fly mesh to stop any insects. Finally they capped in Code 5 lead using welts for joins and fixed with copper ring shanked nails. 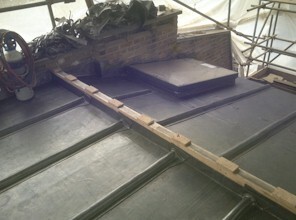 Pictured here is a roof restoration project at Marble Arch completed by LCA member company Merlin Truline Roofing Ltd. 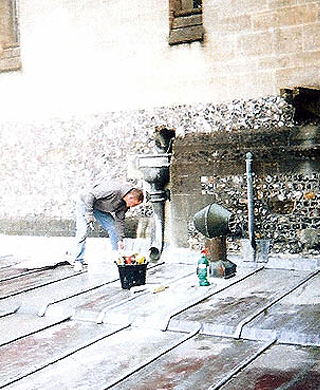 The restoration project was undertaken using lead and reclaimed slate. 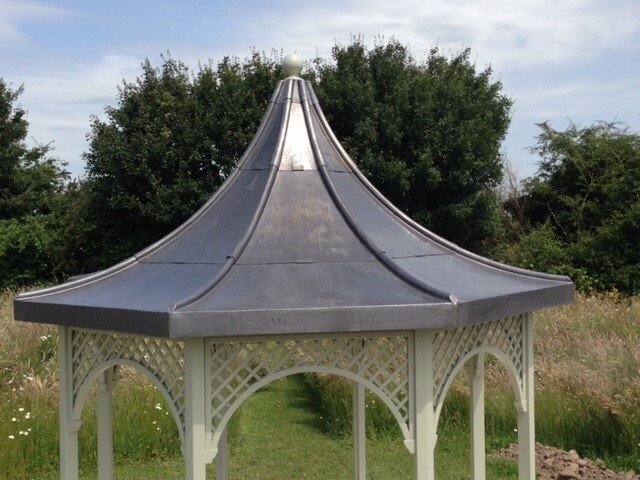 LCA member company John Williams & Company have recently competed this lead roof in Pegwell Bay for NHBC under their BuildMark warranty because the original work carried out by a non-LCA contractor had failed within 8 years. The company believe in the old fashioned values of service and quality, as you might expect from a company established 143 years. 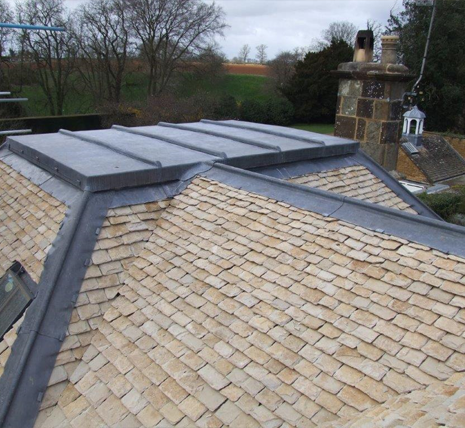 They remain an independent family owned business steeped in tradition and proud of their heritage, specialising in traditional roofing skills including Lead, Kent Peg Tiling, Oak & Cedar Shingles and Slating. Manchester Square (left) and Budwieser Mortlake (bottom right), a 100k refurb of structural roof timbers together with new slating and leadworks are two prestigious projects completed by LCA member Merlin Truline Roofing Ltd. The company consistently receive glowing testimonials from their customers. Mr D Baskey of Purley recently conveyed his appreciation of their work: "We are very pleased with all the work done by Merlin. The lead work is beautiful, in keeping with the house, and up to expectation" he said. 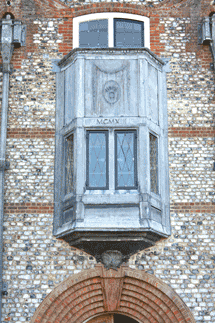 Historic window conservation and restoration - a real challenge! 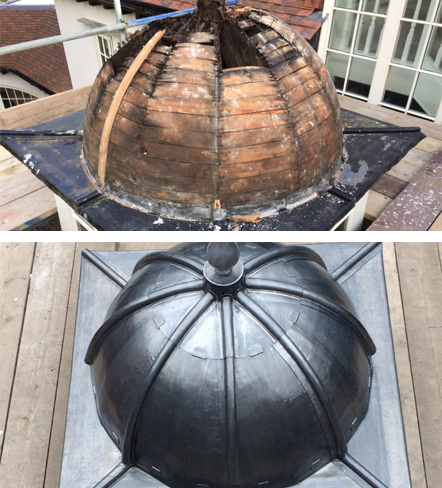 For this major work, by Brian Turner of Turners Ornamental Leadwork, the lead had to be removed and repaired and new fixings, laps and welts created with capillary gaps where none had previously existed. 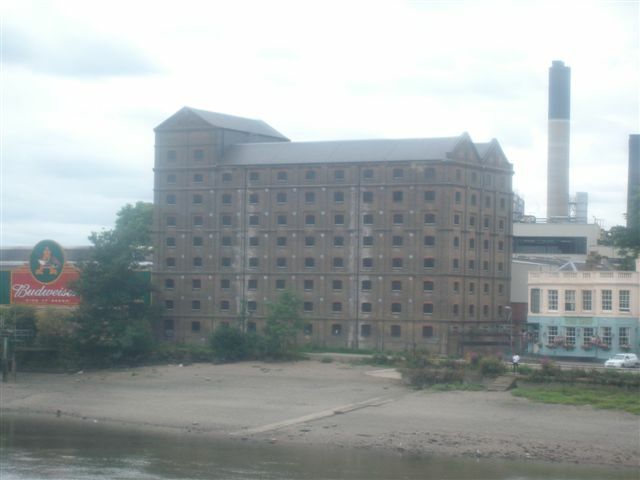 The original installation had been fitted together on the horizontal, with all vertical and horizontal parts burned together, then lifted into position and built around.